Kain is the age of 17 years of age. He is a very rare looking person indeed. He wears a silver gauntlet on his left hand and a golden gauntlet on his right hand. He has two scabbert's on his waist one is golden one is silver. In his silver scabbert there is a short sword with a golden hilt, and another short sword in his golden scabbert with a silver hilt. He stands at a height of 5'11 and still growing (hence his age). 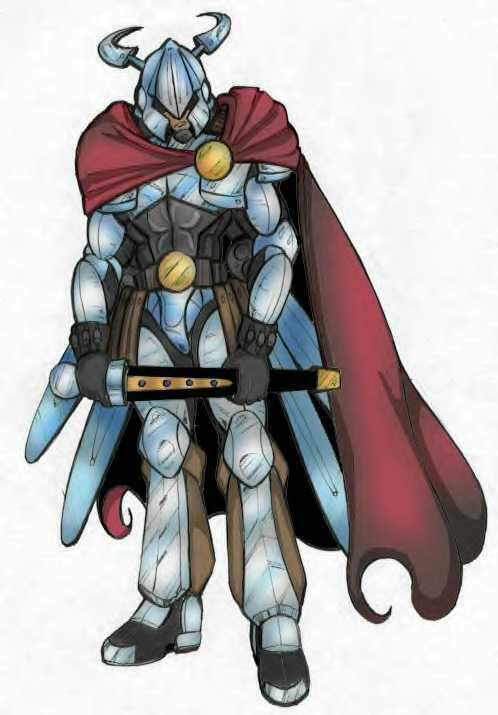 He wears full plate armor made from the scales of a mercury dragon. His boots give him the ability to walk silent among his fellows and enemies. He has silver colored eyes and dark black hair. His skin is tanned beautifully and is smooth, never has it had blimishes on it. He is very popular with ladies by looks, and the few occurences that his wings came out, they have been marked as astonding! Long ago there was a tribe of dragon men that is known as the Ka'Laraz. The people in this tribe look like humans with miniaturized dragons ears. This tribe also had a weird trait, whenever a surge of emotion goes through out a man or woman's body in the tribe, the wings of a red dragon would sprout from their backs, the process is quite painful, for not properly trained people of the tribe. Anyway, Kain had led a very good life. Always having friends and family around him, training more than anyone else in his tribe. He became incredibly strong and when the master of the tribe came down to visit the villagers he noticed Kain training and saw what skill this boy had. The master went up to Kain and asked him if he wanted to join an expedition to vanquish a very powerful foe. Kain of course, seeing this as an honor joined it. Him and 29 other of the Ka'Laraz went out to destroy this evil Wizard who mastered all of the arts of magic. During this expedition Kain turned 15! , on this same day his whole life changed completely. While the warriors were celebrating his birthday, the Wizard attacked them and used the spell, that he created, "Xfer" on most of them. It killed about 27 of the Dragon men, leaving 2 others and Kain himself alive. The Wizard introduced himself as Agannazar. He wiped out the other two warriors, as the tried to protect Kain from a deadly spell also unknown to any race. Kain tried to fight back but to no avail since Kain never seemed to tire, he angered Agannazar. The mage gave him a punishment worse than death. He casted a spell to erase everyone's memory of him that Kain knew. While this was being done, Kain ran back to his village knowing he had no chance. But when he got there know one knew who he was. He was forced to leave after many try's to get them to remember ... so he left for good and hasn't returned there since. He's been traveling for 2 years trying to find a new place to call home. Across these travels he has s! lain many monsters and dragons. One time he slew a mercury dragon that was the king of it's own tribe, and had it's scaled processed into armor which he still wears. He has finally stumbled across the land of Amaraya which seems to be a great place to stay for at least a little while. He enters the lands of Amaraya a powerful young man, ready to take any hardship head on.